Todoist, one of our favorite task managers, has added deep integration with iOS 11 as well as adding a handful of other handy features in its latest update. At its core, Todoist is a web service, but you wouldn’t know it most of the time. Unlike many web service-based apps, Todoist continually adopts iOS-only features that help it compete in a category that is packed with strong rivals. Apple didn’t add many new SiriKit intents with iOS 11, but it did add one for tasks. It took a while to get in the habit of using Siri to add tasks to Todoist, but I’ve been delighted with how well it works. It’s been both quick and reliable. 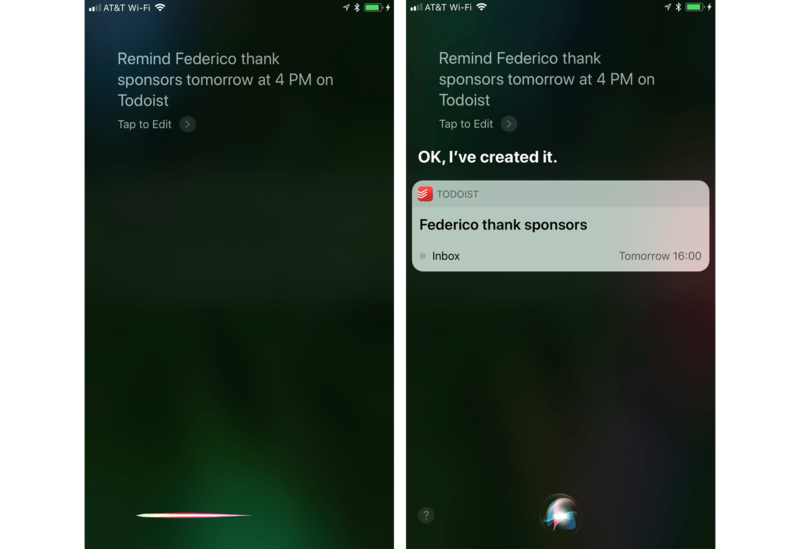 Not only can you ask Siri to add tasks to Todoist, but you can also assign a due date and ask Siri to show you tasks in a specific date range or from a particular list. iPad users can take advantage of drag and drop to add content to Todoist. For example, drag in a Mail message and the subject becomes the task name, and the body becomes an attached comment. You can also drag in images, text snippets, URLs, and other content. However, Todoist does not support dragging tasks into other apps. Todoist is one of the few apps I’ve found so far that implements iOS 11’s new Password AutoFill. You may be familiar with a similar feature that’s been part of Safari for a while. The concept is similar. If it’s stored in your iCloud Keychain, Password AutoFill will suggest that it fill in your password for you, which makes for a much smoother login process. Todoist has a few other nice features in store for users. The app could already attach photos to comments, but now you can attach nearly any file-type. This is especially handy when assigning a task to which you want to attach reference materials. Todoist has also added haptic feedback to supported iPhones when completing or rescheduling a task. Finally, Todoist has a custom Quick Add keyboard that includes ‘@‘ and ‘#’ for faster labeling and task assignment. Todoist continues to evolve with iOS. The new iOS 11 features added to the app make it easier than ever to get information into Todoist quickly and efficiently so you can get on with your work. As Todoist adds features that bring it closer in line with the macOS version, I find myself switching to my iPad Pro for work more and more often. Todoist is available on the App Store.